Even those with no interest in gaming could have failed to notice people going mad for the latest smartphone game, Pokemon GO. 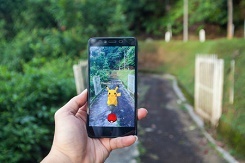 It in, people take to the outdoors to find and ‘catch’ Pokemon characters that are virtually placed in hundreds of locations around the country (and the world!). It’s led to huge numbers of people roaming the streets looking for them and perhaps wandering into areas they wouldn’t usually be. It would seem though that as well as catching Pokemon characters, the game is also useful for catching thieves! One group of players in Doncaster were on the trail of a character when they spotted a couple of people behaving suspiciously in a builder’s yard. They called the police who came out and caught them stealing decking. Other police forces are hoping that the game will facilitate similar results; in Sussex, officers there are hoping that players may have seen something helpful at the time of a theft from a petrol station. It would seem that the community centre opposite is a Pokestop – a designated area where you can collect characters and ‘Pokeballs’. CCTV seems to show a number of cars driving past and stopping and it is thought that these were Pokemon players. Officers investigating the incident are appealing for anyone in the area who may have seen something to come forward. However, while the game might offer an opportunity to catch burglars it’s also supplying them with excuses. There have been several reports of suspected burglars claiming to have been playing the game and ‘accidentally’ wandering onto private property, even when they’ve been caught in people’s homes. And genuine players need to be careful that they don’t do exactly that as people wandering around have been mistaken for burglars which could land them in hot water and has actually resulted in some being shot at in the USA. If you’re a Pokemon player yourself then maybe keep a look out for people acting suspiciously but don’t approach them, just call 999.